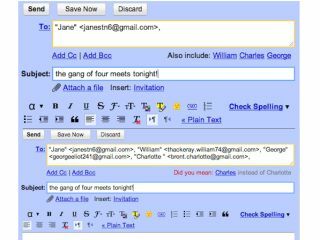 Two handy new features have left Google's Gmail Labs and emerged, fully formed, into actual Gmail. The first is known as 'Don't forget Bob', which offers suggestions of other people you might be meaning to send the email to. So if Ringo were emailing Paul and George, it might suggest he'd want to include John too. Bob also makes an appearance in the second new feature, 'Got the wrong Bob?'. Hoping to make embarrassing mistaken identity issues a thing of the past, if you have two or more contacts of the same or similar names, Gmail will gently ask if you perhaps meant for one of the others to receive that particular email. So, if your boss is called Stephen and your girlfriend is called Stephanie, it could save you a whole heap of shame, no matter which way round you got it wrong. Both features, which follow in the footsteps of the forgotten attachment detector, are set to roll out to all Gmail accounts over the next day or so.